Reality Check: Netbook Sales Growth Slowing Drastically | The Small Wave. The article makes a case that the iPad contributed to this, but it’s simply too soon to conclude anything like that. 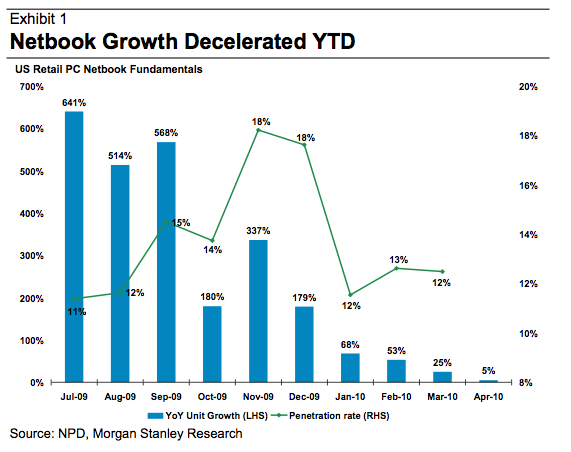 I believe netbook growth keeps slowing as people find out what they really are: cheap cheap laptops. I don’t think the majority of people knew what they were getting. They expect these things to do what a desktop or laptop does, and are finding out it’s too slow and ill-equipped for the job. As it turns out, you really do get what you pay for. A netbook may still be fine for a tech or gadget geek who’s prepared to deal with its limits, but not for the consumer who thinks they’re getting a good ol’ laptop when they’re not. I think the word is getting out, and the netbooks’ wild ride is over. This entry was posted in General and tagged iPad, Netbook, sales, slate, Tablet by Tom Reestman. Bookmark the permalink. Netbooks … gone in a Flash. We will need to see what September 2010 will look like, but , certainly, the iPad is a better VALUE than a Netbook: similar price; does more. iPad or not, I think what the chart clearly shows is that netbooks were a fad that is quickly dying.